Community Dinner: Join us for 4 pm Mass on Saturday, March 10, to see our Confirmation candidates blessed. Then please come to the Social Hall after the service for a community dinner. Confirmation families will also come to the dinner and have a brief meeting during the meal. The meal is free of charge but free-will offerings are accepted. 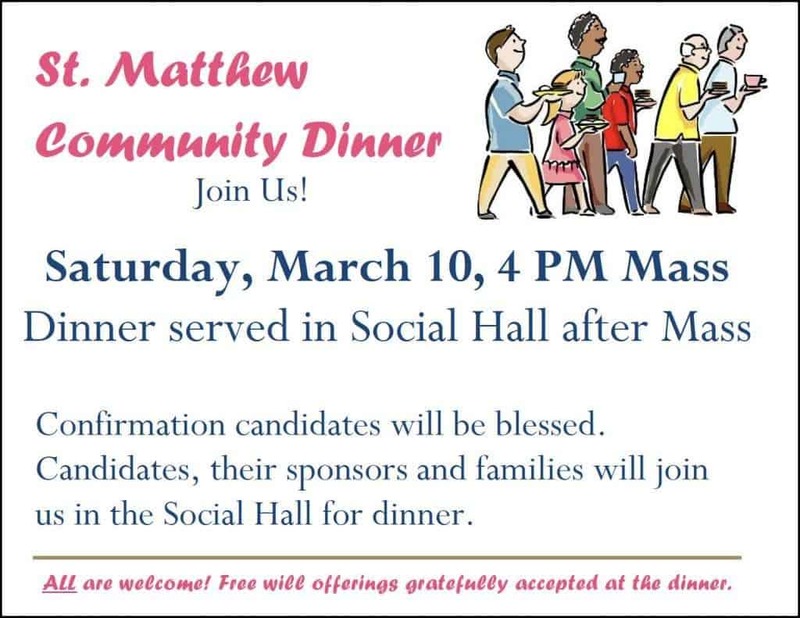 If you would like to help with the dinner—either before or after Mass on March 10—please contact Faith Formation coordinator Janelle Rohr, janelle@st-matts.org or 651-457-3522. You are also welcome to bring a dessert to share and drop it off in the Social Hall kitchen before Mass. Children’s Liturgy of the Word: Teachers are needed for our 20-minute Children’s Liturgy of the Word sessions held during the Sunday 10 AM Mass. You teach a small group of kids ages 3 to 6 and have a student helper with you in the chapel. Curriculum is provided, as are craft supplies. To find out more, including about VIRTUS training, contact Faith Formation coordinator Janelle Rohr, janelle@st-matts.org or 651-457-3522.